Gertrude Carraway was a journalist, historian, leader, mover and shaker. 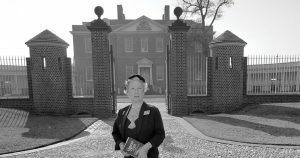 She used her influence to lead the campaign to reconstruct Tryon Palace. For more information on Gertrude Carraway, click here. First in America for a provincial convention called and held in defiance of British orders. First revolving gun made here. First death sentence by a Federal Court in the United States. First in America to celebrate George Washington’s birthday. First in North Carolina and third in America, after Boston and Philadelphia, in celebrating Independence Day. First incorporated school in North Carolina and second private secondary school in English America to receive a charter. First town to get bequest and start free trade school for orphan girls. First free school for white children in North Carolina. First public schools for Negroes in North Carolina. First printing press, first pamphlet, first newspaper, and first book published in North Carolina. First ship in North Carolina constructed and launched here. First steamboat owned in North Carolina. First torpedo put to practical use invented here. First modern naval minesweeper made in State launched here in 1942. First internal improvement in North Carolina, Indians cutting an early canal from near the mouth of the Neuse River across the marshes to Core Sound. First road and first ferry in North Carolina led from New Bern to Bath. First postal service in North Carolina. First post office in State under the Republic. First capital of Independent State of North Carolina, following 34 years at different times as provincial capital; and capital of the Federal Department of North Carolina during War Between the States. First State officials inaugurated here in Tryon Palace, the first state capital building. First State legislature met here. First large four-faced clock on a building in State, if not in world. First in North Carolina to decorate streets with vari-colored electric lights during the Christmas season. First motion picture theatre built from ground up in the State. First in State to organize County Dramatic Association, with branches in all high schools. First in State to sponsor programs and offer essay prizes on highway safety in all County schools. First public banking institution for State of North Carolina, 1778. One of the first two banks chartered in state, 1804. First steam sawmill in area. First macadamized road in region. First in State and second in country to organize Girls’ Hi-Y Club. First in North Carolina to observe Local History Month, mark historic spots, issue free guide-books, and offer guide services. Oldest theatre in America still in regular operation here. Oldest benevolent society still in existence in State and perhaps second in the United States. Oldest school building still in use in North Carolina and one of the oldest in America. Oldest Catholic parish in America. Oldest Christian Science Church in East Carolina. Oldest Presbyterian church organization and building in presbytery. Oldest fire company in State with the earliest charter still in existence. Several world records have been broken by firemen. Oldest instances of paternity on official medical records. Smallest city in the United States to confer all Masonic degrees except the 33rd, and have a Shrine Temple. Most historic communion equipment in the country – silver communion service, Bible and prayer book presented to Episcopal Church in 1762 by King George II of England; and one of three sets of communion cloths in America made of memorial laces from all over the world. More fine examples of early American architecture than any other town of size. More genuine antiques and local relics than any town of region. One of the first towns of its size in the nation to own its electric light plant and start rural electrification. One of the first cities anywhere to organize a modern Community Council to aid unemployed and needy. One of the first ten Coast Guard cutters of the United States was reconstructed here. One of the first mutual fire insurance companies. One of the oldest gasoline buggy-automobiles that still runs was made here. One of the oldest Episcopal parishes in the South. One of the oldest hotels, the Gaston, in the South. One of the largest collections of ancient weapons. One of twenty most historic trees of America. Only town in North Carolina with three railroads as well as water transportation. Only town probably to have had a founder with title of nobility bestowed for America. Only town in State and perhaps in America to adopt and own a City flag presented by the European capital for which it was named. Only town also perhaps to have distinguished namesake, settled and named by its aborigines – Tuscarora Indians from here giving the Indian name of their local village, “Chattawka”, to the now-famous Chautauqua, NY.